These machines are very interesting. I have seen capsules all of my life but I never thought about how they were filled until I had to fix this machine. 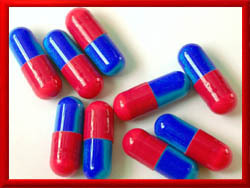 Capsules are miniature containers made in two separate halves that slip together to form an enclosure, usually for powders or liquids. They are made of a type gelatin that dissolves safely in the human digestive system without any toxic side effects. The capsules halves are made separately and then assembled together for shipment to the end user. Keeping the halves assembled until they are filled is more sanitary and more durable than any other method. The assembled empty capsules are usually then loaded into a hopper on a machine like the one you see above. This machine is high-speed automatic capsule filler. It has two rotary drums. The first drum accepts the capsules from a hopper above and lines them up with a slot in the drum and inserts it. Suction cup fingers above and below pull the capsule halves apart. Once the top is off the capsule, at the 180-degree point the lower half gets transferred to the second drum, which has the dosing nozzles. This drum has a hopper on the top with the ingredients for the capsules and through the dosing nozzles fills the lower half with the powder or liquid. At the 360 degree point the filled lower half is transferred back to the second drum which reapplies the top half of the capsule and ejects it out off to the side after another 180 degrees of rotation. The machine above was an older design, but the new ones today can hit speeds of 140,000 capsules per hour. These machines go so fast their motion is just a blur.